Year 7s have been perfecting the wall clocks they are making as part of the Design and Make challenge in Design Technology. The task introduces them to the skills and knowledge needed to identify appropriate materials for the objects they make, as well as how to use tools and equipment safely and correctly. 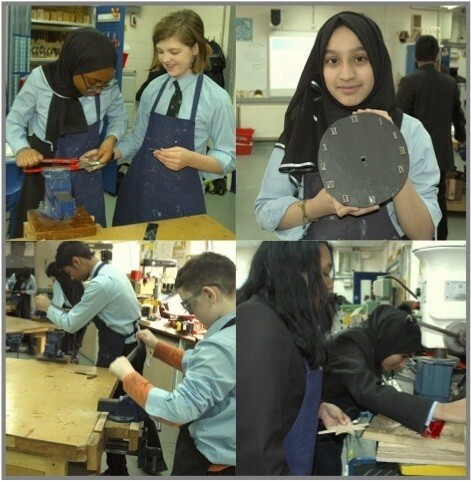 The task also lays the foundation for studies at GCSE level and above. In a separate exercise, Year 8 pupils made identity dog tags from aluminium strips. The instructions they followed were: cut the aluminium to 70mm in length, clamp it in a vice, smooth the edges with a file to remove the burrs, round off the corners and shape.